Surprise! Surprise! The Reynolds Home Campaign for matching funds for the Christmas Solar Panel Project was boosted way up on Giving Tuesday, Nov. 29. 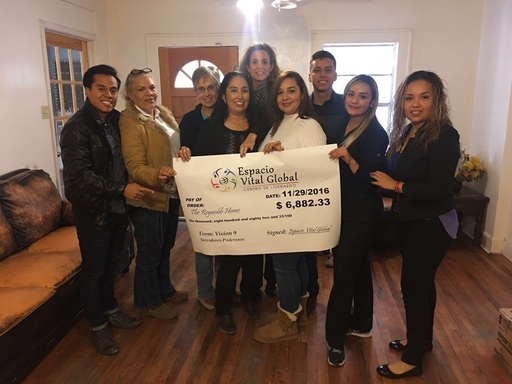 Vison 9, a class of 6, at the Espacio Vital Global, a Center for Leadership in El Paso, presented a check for $6,888.33 towards the sum needed. That’s 62% of the total $11,000. The check was handed to a very happy Executive Director, Dorothy Truax yesterday morning amid friends of the group and Reynolds Home who had gathered at the Home. Only one month earlier, the group made its first visit to the shelter and spoke about the annual tradition of graduating classes (called Vision groups) at the Center for giving back to the community. On cmpletion of their program of transformation through experiential workshops, each group chooses a non-profit agency project to benefit from fund-raising activities. Vision 9, chose the Christmas Solar Panel Project recently announced by Reynolds Home. The group jointly set a goal for each member to raise $1,000 for the matching fund. From bakesales to closest friends’ arm-twisting to family to grade-school, middle and high-school friends, each group member worked her/his audience to cough up the required funds by the Tuesday Giving deadline. 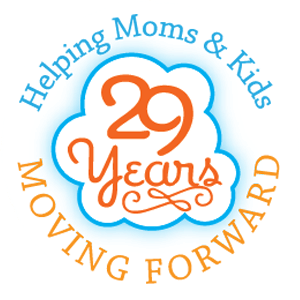 Result: $888.33 exceeding the GOAL! What a Launch for our Project! Thank you Vision 9 and Espacio Vital Global! In the picture above, members of Vision 9 present the check to Dorothy Truax, Executive Director. Center highly efficient in leading the human being in all areas of its life positively contributing and impacting their family, their community and the world.